Thirty-eight years ago I came from Brigham City to the office I now occupy in the Administration Building to see Elder Harold B. Lee, who, next to President Joseph Fielding Smith, was the senior member of the Quorum of the Twelve. I had just been appointed the supervisor of Seminaries and Institutes of Religion. I knew there were serious problems in the system and I wondered why they had not appointed someone with more experience. Elder Lee had agreed to give me counsel and some direction. He didn't say much, nothing really in detail, but what he told me has saved me time and time again. "You must decide now which way you face," he said. "Either you represent the teachers and students and champion their causes or you represent the Brethren who appointed you. You need to decide now which way you face." then he added, "some of your predecessors faced the wrong way." It took some hard and painful lessons before I understood his counsel. In time, I did understand, and my resolve to face the right way became irreversible. One of the early lessons was also my first lesson in correlation. The seminaries were sponsoring speech contests., They were very successful -- much better than similar contests sponsored by the Mutual Improvement Association. It was an ideal gospel-centered activity for seminaries. They were succeeding beautifully under able teachers who could assist even the shy students. We were instructed to discontinue them! There was something of an uprising among the teachers. They accused Superintendent Curtis of the Young Men and President Reeder of the Young Women of being responsible. Perhaps they were. The teachers wanted Brother Tuttle and me to plead their cause before the Brethren. The logic was all on our side. Nevertheless we remembered the counsel of Brother Lee, and really, just out of obedience, we declined. Later I could see that the seminaries served then only a very small part of our youth; the MIA, all of them. A B-minus program reaching most of the youth would, in the aggregate, bring better results than an A-plus program which reached relatively few. It wasn't until many years later, when some other problems arose, that I could see that those contests, even though they were gospel centered, pulled the teachers into an activity-oriented mind-set and away from the less exciting responsibility of teaching the Old and New Testaments to teenagers. Finally I could see that the very success of the program was an enemy. Other lessons followed, some of them hard ones. I was asked to write an article for the Improvement Era. It was returned with the request that I change some words. I smarted! The replacement words didn't convey exactly what I was trying to say. I balked a bit, and was told that Richard L. Evans, then of the Seventy and magazine editor, had asked that the changes be made. I remembered Brother Lee's counsel. I had to submit. Now, though that article is piled under thirty-five years of paper, I'm glad, very glad, that if someone digs it out, I was "invited" to change it. 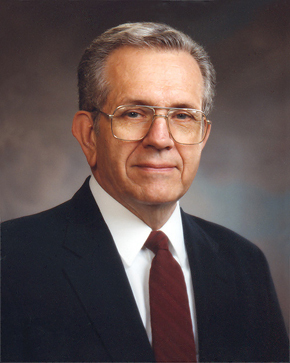 After one of my first general conference talks, I received a call from Joseph Anderson. In a very polite way he said that President McKay and his counselors suggested that I add one word to the text of my talk. Would I mind doing that? Actually the word was in my text, I just failed to read it at the pulpit. A most embarrassing lesson -- the First Presidency! It was easier when Elder Evans corrected my work; even easier when one of my associates was kind enough to do it. Only last Friday while putting together some things for a presentation, I read part of it to some brethren from BYU. I noticed they looked at one another at one place in my reading, and I stopped and asked if there was a problem. Finally one of them suggested that I not use a certain scripture that I had included even though it said exactly what I wanted to convey. How dare they suppose that a member of the Twelve didn't know his scriptures! I simply said, "What do you suggest?" He said, "Better find another scripture," and he pointed out that if I put that verse back in context, it was really talking about another subject. Others had used it as I proposed to use it, but it was not really correct. I was very glad to make a change. Now you may not need a correlating hand in what you do, but I certainly do. This brother lingered after the meeting to thank me for being patient with him. Thank me! I was thankful to him. If I ever make that presentation, it will only be after some of our Correlation staff have checked it over for me. Now I give you all full credit for knowing more about your work than anyone else -- more, certainly than the staff of the Correlation Department. That is how it should be, for you are hired or called to be a specialist. I also know from experience how easy it is to get turned around, and, as Brother Lee warned, to face the wrong way. However much you know about your work, I doubt that you know, or have the time to learn, as much as do the Correlation staff about how your work interacts with everything else that is going on. The Council of the Twelve Apostles is the Correlation Committee, with the President of the Twelve and the two senior members acting as the executive committee. Correlation is the one department where they are hired to be generalists. They represent the Brethren in pointing out to you areas where you, in one detail or another, might, in the interest of the overall program, need to make an adjustment or two. The principle of correlation is a sound principle. Except for its having been established, we could not now possibly administer an ever-growing multi-national and multi-lingual church. The full purpose for its having been established, I know, is yet to be realized. If we neglect it, we will pay a very, very heavy price one day. The value of having struggled through those years, and there aren't many around who struggled through those years, will one day be apparent. The greatest use of this is yet to come. The responsibility to effect a reduction and simplification in programs was assigned by the First Presidency to Correlation Department. We have been only modestly successful at best. Perhaps just to have slowed the growth is enough reward for all the effort that has been put in. There are isolated success stories. The Music Department, catching the vision, reduced five manuals of 190 pages into one manual of 18 pages. They did it themselves, and they count themselves better for it. Perhaps too many of us are strong advocates of our own specialized work or are such strong protectors of our own turf that we face the wrong way -- maybe just sideways. Simplification and reduction must come. Simplification and reduction will come! If we cannot do it on our own -- and we seem to be in that circumstance -- the future will see us doing, in anxious haste, that which we might have done with deliberate care had we followed the vision which has been given to us. "May 3rd marks my 18th year in the Church. As a gay Mormon, I have witnessed and experienced first-hand during those eighteen years what it's like to be a homosexual in a Church which is sometimes less than accepting of its gay members. My experiences have run the range from incredible, Spirit-filled and loving encounters with members, Bishops and Stake Presidents to a laughable run-in with a departing Mission President. May I share with you some of the more permanent and meaningful memories?" After a page or two of those, he said, "So in a spirit of friendship I offer that which I have to give -- the life experience of a gay Mormon. At your convenience I would be happy to meet with you to discuss the issues facing gay Latter-day Saints and the Church. The purpose for meeting is not to debate, or to presumptively call you to repentance, or to be called to repentance myself for being gay. The point is to meet together and share what we have for the good of The Kingdom and the furthering of the Will of the Lord on Earth." "My concern is that the Brethren are contending with the church's own scholars. ... In the Catholic Church, the great scholars' efforts were used by the Church to refine and strengthen the doctrine (St. Augustine, Thomas Aquinas, for example). In our Church, the scholars are put down, even banished [and he names three of them, and they would be names all of whom you would know]. Once again I extend an offer to you to be a peacemaker between the Brethren and the scholars, if you wish me to attempt it, since I know so many in both groups. More than that, I understand the mind-sets of both groups." These letters and hundreds more are from members who are hurting or leaders who are worried. I might say here that I can see in the last few weeks a change in the letters coming in. There isn't time to talk about it now, but out in the Church there is another growing group of the discontented. That is the rank and file who are trying to do what they are supposed to do and feel neglected as we concentrate on solving the problems of the exceptions. Those who are hurting think they are not understood. They are looking for a champion, an advocate, someone with office and influence from whom they can receive comfort. They ask us to speak about their troubles in general conference, to put something in the curriculum, or to provide a special program to support them in their problems or with their activism. When members are hurting, it is so easy to convince ourselves that we are justified, even duty bound, to use the influence of our appointment or our calling to somehow represent them. We then become their advocates -- sympathize with their complaints against the Church, and perhaps even soften the commandments to comfort them. Unwittingly we may turn about and face the wrong way. Then the channels of revelation are reversed. Let me say that again. Then the channels of revelation are reversed. In our efforts to comfort them, we lose our bearings and leave that segment of the line to which we are assigned unprotected. The question is not whether they need help and comfort. That goes without saying. The question is "How?" The Prophet Joseph Smith, when he organized the Relief Society said, "There is the need for decisions of character aside from sympathy." To illustrate principles which apply to all of these problems, I have taken one common one -- working mothers. President Ezra Taft Benson gave a talk to wives and mothers. There was a reaction within the Church. (Ten years ago, that would not have happened.) That was very interesting, because if you read his talk carefully, it was, for the most part, simply a compilation of quotations on the subject from the prophets who have preceded him. Some mothers must work out of the home. There is no other way. And in this they are justified and for this they should not be criticized. We cannot, however, because of their discomfort over their plight, abandon a position that has been taught by the prophets from the beginning of this dispensation. The question then is, "How can we give solace to those who are justified without giving license to those who are not?" The comfort they need is better, for the most part, administered individually. To point out so-called success stories inferring that a career out of the home has no negative effect on a family is an invitation to many to stray from what has been taught by the prophets and thus cause members to reap disappointment by and by. I think President Thomas S. Monson may not appreciate what I am going to say now. I know of no one who maintains such a large private ministry of counsel and comfort in the midst of heavy pressures of office than does Brother Monson. He says very little about it, but he visits the sick, hospitals, homes, comforting, counseling, both in person and in writing. However, I have never heard him over the pulpit, nor have I read anything in his writings -- not one thing -- that would give any license to any member to stray from the counsel of the prophets or to soften the commandments that the Lord has given. There is a way to give comfort that is needed. If we are not very careful, we will think we are giving comfort to those few who are justified and actually we will be giving license to the many who are not. The process of correlation is designed to keep us from making mistakes in manuals, in publications, in films, in videos, in those specialized programs which are justified. Those fifteen words from Alma state: "God gave unto them commandments, after having made known to them the plan of redemption." There are many things that cannot be understood nor taught nor explained unless it is in terms of the plan of redemption. The three areas that I mentioned are among them. Unless they understand the basic plan -- the premortal existence, the purposes of life, the fall, the atonement, the resurrection -- unless they understand that, the unmarried, the abused, the handicapped, the abandoned, the addicted, the disappointed, those with gender disorientation, or the intellectuals will find no enduring comfort. They can't think life is fair unless they know the plan of redemption. That young man with gender disorientation needs to know that gender was not assigned at mortal birth, that we were sons and daughters of God in the premortal state. The woman pleading for help needs to see the eternal nature of things and to know that her trials -- however hard to bear -- in the eternal scheme of things may be compared to a very, very bad experience in the second semester of the first grade. She will find no enduring peace in the feminist movement. There she will have no hope. If she knows the plan of redemption, she can be filled with hope. The one who supposes that he "understands the mind-set of both groups" needs to understand that the doctrines of the gospel are revealed through the Spirit to prophets, not through the intellect to scholars. Only when they have some knowledge of the plan of redemption will they understand the supposed inequities of life. Only then will they understand the commandments God has given us. If we do not teach the plan of redemption, whatever else we do by way of programs and activities and instructions will not be enough. "God gave unto them commandments, after having made known unto them the plan of redemption." We face invasions of the intensity and seriousness that we have not faced before. There is the need now to be united with everyone facing the same way. Then the sunlight of truth, coming over our shoulders, will mark the path ahead. If we perchance turn the wrong way, we will shade our eyes from that light and we will fail in our ministries. God grant that a testimony of the redemption and knowledge of the doctrine will be so fundamentally in our minds and in our hearts that we will move forward with his approval. This Church will prevail. There is no power in existence that can thwart the work in which we are engaged. Of that I bear witness, and of him who is our redeemer I bear witness in the name of Jesus Christ, amen.